In April, at the closing of the World Bank and IMF spring meetings in Washington DC, the World Bank Group (WBG) and the Asian Infrastructure Investment Bank (AIIB) signed a memorandum of understanding “to strengthen cooperation and knowledge sharing between the institutions.” The agreement was signed a year after both institutions signed a co-financing agreement outlining “the co-financing parameters of World Bank-AIIB investment projects” (see Observer Summer 2016). The Bank and AIIB have co-financed five projects together since. 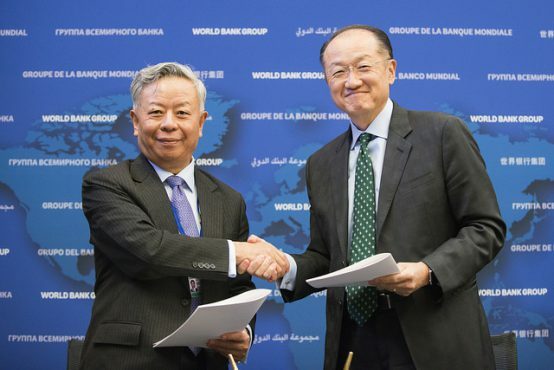 Co-financing and cooperation between the Bank and AIIB reflect the trend toward increased coordination and joint financing by multilateral development banks (MDBs) to meet what is claimed to be a yearly $1 trillion to $1.5 trillion infrastructure financing gap in developing countries by 2020. The MDB focus on leveraging private sector investments for mega-infrastructure projects was evident in the 2017 Global Infrastructure Forum (GIF) outcome document. The World Bank-AIIB trajectory is at odds with principles for better MDBs outlined in the Eurodad, Afrodad and Latindadd April concept paper Public Development Banks: towards a better model, which argued that MDBs must prioritise development outcomes over profit and stressed that, historically, infrastructure development has been primarily publicly financed. María José Romero from Brussels-based network Eurodad noted that, “MDBs must support infrastructure development that benefits communities and helps countries transition to a new development model.” In light of the evolving relationship among MDBs as reflected in the 2017 GIF outcome document, civil society fears that the AIIB, far from providing developing countries a different development and financing paradigm, is on its way to supporting existing development models that do nothing to assist developing countries transition from commodity-dependent economies (see Observer Summer 2017). The Tarbela 5 dam in Pakistan provides an opportunity to assess how co-financing is affecting the AIIB and World Bank’s approach to environmental and social safeguards. The AIIB and World Bank are co-financing the dam together with the government of Pakistan. While the AIIB had committed that its $300m loan would not only finance the new construction but also address ‘social legacy issues’ from previous projects, closer scrutiny by NGO Bank Information Center (BIC) Europe and Pakistani researcher Naeem Iqbal cast doubt on that assertion. BIC Europe argued that the AIIB’s legalistic approach seems likely to leave many people displaced by the previous construction without remedy. The study also asserted that “though clearly part of the Tarbela 5 project, the World Bank removed the grid station from the project to avoid the AIIB having to address land acquisition and resettlement issues, according to the WB’s representative.” Finally, BIC and Iqbal noted that important access to information procedures did not follow best practice. In a June article on news site Chinadialoge, Kate Geary, of BIC Europe, noted that while the AIIB “explicitly commits to the Paris Climate Agreement and the United Nations’ Sustainable Development Goals”, its energy strategy does not specifically stop the AIIB from financing coal. Geary noted that 31 Indian CSOs have written to the AIIB to express their concern that “the supposedly ‘green’ bank still may end up funding dirty fuels across Asia, including coal and gas thermal plants, as it does not exclude these.” Geary’s article also criticised proposed AIIB investments through financial intermediaries (FIs) and in India’s Infrastructure Fund in particular, referencing the negative developmental impacts of the International Finance Corporation’s (IFC, the World Bank’s private sector arm) investments in FIs (see Observer Autumn 2017, Autumn 2016). In March 47 international and Indonesian CSOs wrote a letter to the AIIB requesting that they withhold support to the Indonesian Infrastructure Fund and Regional Infrastructure Development Fund (RIDF) citing concerns over social and environmental assessments and lack of appropriate consultation (see Observer Spring 2017). Disregarding the concerns, on 28 March, the AIIB announced that it had approved a $100 million dollar loan to the RIDF.